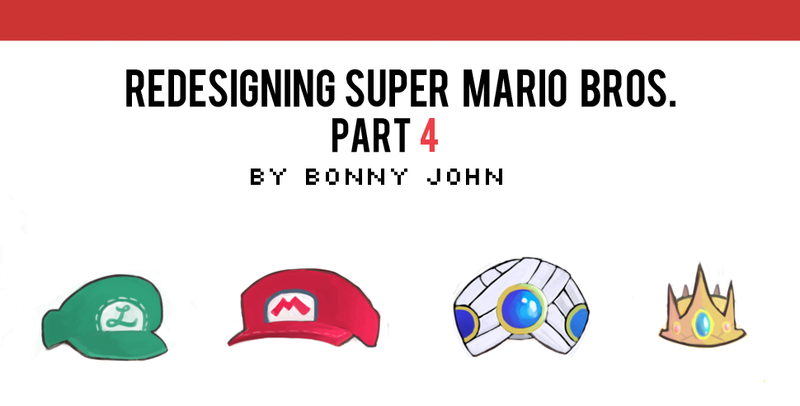 Welcome to part four of Redesigning Super Mario Bros! We've seen several of the major characters get a bit of a rework, today we got a proper look at some of the enemies they'll be facing on their adventures. Ninji is a character who I decided to revamp quite a bit in comparison to the many I've done. Looking at the old Ninji, I decided to translate the pointy bits on its head into actual ears and the red "dots" near its mouth to be fangs. Yes, this new Ninji is a bat. It should be noted that this in my mind is a fusion of Ninji and the enemy Fuzzi, both who have similar visual traits. This Ninji has the Fuzzi attack style of leeching onto its victim, in addition to the traditional attack paterns of a Ninji...which is just jumping up and down. The addition of wings allows Ninji to change up its attack style by hovering a bit longer in the air before coming back down, mixing it up a bit so its not too predictable like before. Overall, I think this concept is a lot of fun and makes the old Ninji a lot more interesting visually and as an enemy. Isn't he so...adorable!? Shy Guy is one of the earliest concepts I created for this series, amidst other famous enemies who have yet to make their appearance. My concept for Shy Guy involves giving them a legitimate background. They're called Shy Guys...Why are they shy? Who are they really? Well get this - My take is that Shy Guys are Toads from the Mushroom Kingdom who have turned against their kind. For their own personal reasons, these Toads leave and joined the leader of this particular group of minions. Because they are Toads in a new outfit, you can see that this concept is smaller than the traditional Shy Guy. The leader of this group decided that, as great as it was that he had gotten new foot soldiers, he felt they should be punished for betraying their old kingdom nonetheless. The face masks given to the new Toad recruits is to obviously hide their identity but also help develop a new sense of loyalty, ironically. Because they tossed away their old allegiance, what's to stop from them leaving again? Wearing this permanent look of sadness that reflects their inner turmoil is part of the process of becoming a loyal minion to this new army being built by their leader. Because of this emotion and the fact that no one really knows what's hiding underneath the mask and suit, outsiders have nicknamed this character "Shy Guy". I played a lot with the mask, more than anything else for this design. I basically wanted to avoid having the fella look like Meta Knight, so two separate eye holes like the regular mask was kept, and I had concepts where he had various emotiosn present. Making him look sad/shy was the best route. I also decided to throw away the blue shoes and make brown everything, for uniformity. Bet you didn't know these guys had a name, huh? Well its not "canon-head shy guy". Snifits are a variation of Shy Guy who have "graduated" a tier. Future Snifits in training can be seen in Shy Guys who are particularly aggressive. They are given a backpack to hold their ammunition, which is fed through their outfit in a simple but efficient system not visible from the outside. Pretty advanced stuff. The Snifits come in a variety of colors depending on their rankings. I chose blue to represent the lot as it sat nice next to the regular red Shy Guy. They look more fierce due to a new set of eye holes on their darker masks, their hoods end in a more aggressive style (which by the way was originally Shy Guy's hood, I added Snifit later) and have darker boots and gloves. Originally I gave them white gloves, boots, and the strap for their mask was lighter in tone as well, but it looked to pristine for a character that's shooting objects out of their mouth. Mouser isn't a particularly well known enemy, and his original look leaves a lot to be desired in my opinion. Most people will remember Mouse style enemies from Yoshi's Island and Paper Mario. This Mouser is based off of SMB2 style, as is the main theme of this set if you hadn't figured that out. I originally planned for Mouser to be fatter, and more squat, as someone who lets the bombs do all his work. However, I opted for someone a bit more leaner at the end- They are constantly jumping and running around after all. Mouser are known for throwing bombs - I let the bob-omb from the previous set come back as an accessory for Mouser here, which tells you the Wario brothers found a business partner in the leader of this set of enemies. The new goal was to make someone who looked shady, smug, and untrustworthy. Mouser's original design in my opinion is very ugly. He's just a dull gray blob with pink gloves and shoes...A bit random and not very interesting. I mean, he is just a mouse, but that doesn't mean he can't have any style or attitude. By giving him his trade mark glasses, I coupled ear-rings and a slicked back pompadour to give a "greaser" feeling, someone who you wouldn't want to mess with. He just looks like he could play dirty, ya know? I made his tail one of the main features, having it be a third arm of sorts, which can pick up and fling bombs for him. The way this illustration is set up makes it look like Mouser is relaxing as the tail seems to have a mind of its own, ready to fling this bomb at its target! The overall idea of Birdo here was to make it more than just another version of Yoshi. Birdo is noticeably larger than Yoshi in my rendition. Before, the two were very similar in stature...Not anymore. Birdo is taller, has a longer and thinner snout and has more spikes on its body than Yoshi. This is because I wanted to convey a creature that is visually more aggressive to match its original nature as seen in SMB2. It was fierce; jumping about and firing eggs at you, trying to take you down. Now Birdo is a sassy little thing twirling about...Not that there's anything wrong with that. It's just that as an enemy, it's got to look like it'll do damage, while being pink and fabulous of course. Birdo's new eggs have their own style to them, like Yoshi's. Why leave them plain like the original? Overall, the concept is more dinosaur than before and what creeped me out about the old Birdo is how vast and open the old mouth was. Here, it looks like she can open up her mouth and speak and has a form for just shooting out eggs by closing them giving them a propel barrel to travel through like a cannon - which is why her snout and neck is longer than the original, giving a feel that an egg has to loaded, and then fired like a traditional weapon of sorts. Pokey is a design who I didn't really redesign like the others. It looks a lot like the old Pokey but more upgraded, which I think is fine for the direction I wanted to take. My idea for Pokey is that its always reconfiguring itself. Unless Mario destroys all parts of Pokey, there are going to be left overs that may be eaten up by the sand who then lie in waiting for various other parts to stroll by. This Pokey has three heads and has various emotions that give it tons of personality. I also gave Pokey some cactus arms to make it even more of a threat. The idea of Pokey is that you defeat it one by one, until you have just a head at the bottom of the "tower". Because there is a spike on the head of Pokey, it's difficult to jump on the head to defeat it, so one ends up using a hammer or koopa shell to knock the bottom portion off, lowering the tower by one. If the player gets to a Pokey body that has an arm, the arm has the ability to swat away the hammer strike or turtle shell, which makes it harder to defeat. There are various color Pokeys, originally there's a yellowy one and a green one. I decided to combine both, in the sense that the bottom mouth is getting the most nutrients by drinking more water, barely sending any up to the ones at the top. Hence half way, the green is fading to an olive green, and the top is parched and therefore more angrier and dry in appearance. This new rendition is fun to look at, and was actually very fun to paint. See you tomorrow with another update! Hope you enjoyed today's set! As always, leave me some feedback!